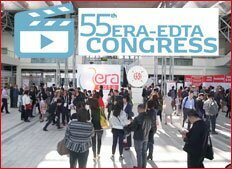 Impressions from the 55th ERA-EDTA Congress in Copenhagen. Watch the video! View a selection of the 55th ERA-EDTA Congress photos! Complete the post-congress feedback questionnaire! The Final Programme is now online. Click here to read it and find all the info about the Congress! Please note that this is the ONLY Official Website for the 55th ERA-EDTA Congress (May 24-27, 2018, Copenhagen).